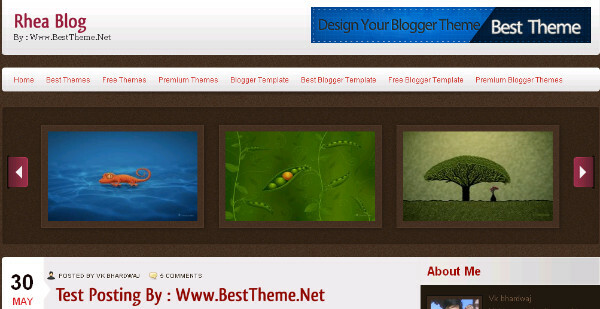 Best Blogger Templates Style - Rhea is a Two Column Magazine Blogger Template with a right sidebar.The color scheme has a Brown background and sections with a white posting section.Rhea has a cool featured slider for featured posts and specialized comment section and read more summary's.You can download The Rhea Magazine Blogger Template for Free from BestBloggerTemplates.Net. please, do you know how to delete the slider? thx in advance!